We had a very successful lambing with … lambs from …ewes. We only have 5 orphan lambs on the farm at the moment as the rest have been moved to fresh pasture. 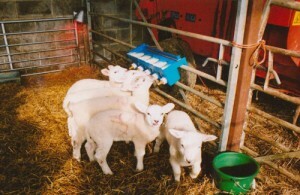 We look 5 lambs from 5 triplets so that we could rear them by hand, so they aren’t really orphans. A ewe has only 2 teats so three lambs have to fight over them. These lambs are doing very well in the barn and skipping all over the place. We managed to get the campsite ready for Easter with the cement just being dry enough on the chemical disposal unit to use by Easter Sunday. We ran out of road planings but had enough to cover 2/3s of the main drive and cover the area around the recycled waste compound and chemical disposal unit. Lots of large potted shrubs and tulips have been placed around the cabin area and entrance to the campsite to enhance its appearance. I have been planting lots of seeds in the greenhouses and hopefully should have a lovely display of sweet peas and sunflowers in the summer and piles of pumpkins in the autumn and winter.